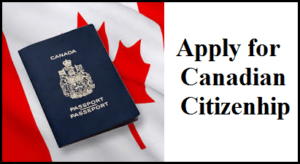 How to apply for Canadian Citizenship? According to the government of Canada, due to revised rules implemented in October 2017, the number of migrants receiving Canadian citizenship has been increased. This rise has made it easier to obtain Canadian Citizenship. The Number of days a permanent resident has to be physically present in Canada in order to apply for Canadian citizenship was reduced by the government of Canada. So Immigration, Refugees and Citizenship Canada (IRCC) have estimated that a total of 152,000 people will have received Canadian citizenship after those changes. Earlier, in order to apply for Canadian citizenship, a migrant living in Canada as a Permanent resident has to be physically present in Canada for 4 years out of 6 years. But according to revised rules that were implemented in October 2017, a migrant living in Canada as a Permanent resident has to be physically present in Canada for 3 years out of 5 years for the same. There was a 40 per cent increase in the number of people who received Canadian citizenship over the 12-month period in 2016-2017 after the revised rules came in action. Along with this, the number of applications for Canadian Citizenship also increased rapidly 242,680 in the nine months after the revised rule came in action. Not only this but also the language and knowledge requirements for citizenship, which had been mandatory for applicants between the ages of 14 and 64, to applicants between 18 and 54 years of age was also changed by the government of Canada. Also, the changes made in legislation known as Bill C-6, allowed applicants who had spent time in Canada in the previous five years as a temporary resident or protected person to claim up to 365 days towards the three-year physical presence requirement, with each day spent in Canada counting as a half day. If you want to get Canadian Citizenship, then first you need to apply for the Canadian Permanent resident visa. So if you want to get a Canada PR visa, then you should look for the best immigration consultant that can handle your process in a professional way. To get more information about, you can directly contact us over the call by ringing us at 011-41075840 / 011-41045840 or you can mail us on our email id at info@countrywidevisas.com.